A specialty healthcare REIT joins a pair of offbeat stocks to make up our trio of dividend lifters this week. 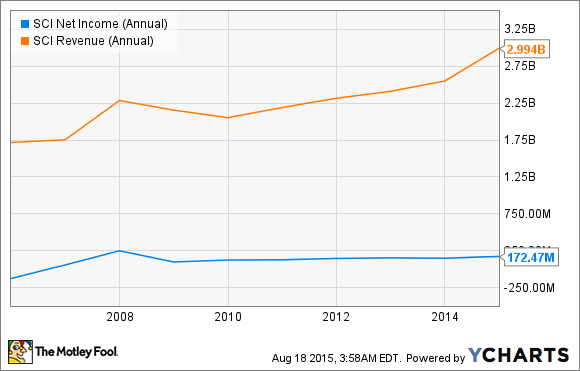 Are dividend increases drying up? The flood of companies declaring increases is turning into a stream, with only a relative handful doing so last week. That's to be expected now that we're starting to emerge from the second-quarter earnings season. Americans are getting older and, inevitably, requiring more medical attention. That results in good business for the healthcare sector in general, and this real estate investment trust in particular. As a result, Healthcare Trust of America has lifted its quarterly dividend, albeit incrementally by 2%, to just under $0.30 per share. This was effected just after the specialty REIT (which concentrates on leasing medical office buildings) released Q2 results that showed growth in the right areas. 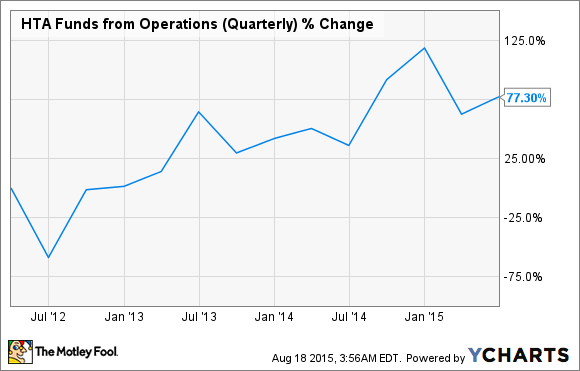 Funds from operations climbed by nearly 12% on a year-over-year basis to $48.5 million. This was on the back of a lift in total rental income by roughly the same percentage to just under $100 million. Meanwhile, in Q2 the overall occupancy rate was just over 91%, a slight increase from the second quarter of 2014. Healthcare Trust of America operates in a field that'll only grow, particularly considering that the massive Baby Boomer generation is reaching its golden years. It also occupies a niche with obvious demand. It's doing just fine, and likely to continue to do so. We can count on it maintaining its payout, then, or even bumping it higher as time goes on. Healthcare Trust of America's freshly raised dividend is to be paid on October 5 to stockholders of record as of September 28. Believe it or not, there's profit after death. At least for this company, which specializes in the provision of funeral services. Service Corporation International's quarterly dividend is alive and well, thank you very much -- the company just lifted it by 20% to $0.12 per share. The company is the clear leader in its industry, thanks in no small part to its habit of acquiring the competition. Most notably, it swallowed its top competitor, Stewart Enterprises, in a 2013 deal worth $1.4 billion. Helped by additions like that over the years, Service Corporation International has managed to steadily grow its top line and remain profitable. And it's one of those companies that reliably pays a quarterly dividend -- it's handed one out for over a decade now. Meanwhile, those sturdy financials result in strong free cash flow, at levels well above what the company pays out in shareholder distributions. Service Corporation International's new dividend will be paid on September 30 to holders of record as of September 15. In what is absolutely a first for this article series, our highest raiser in percentage terms is a furniture retailer. Sofa and table purveyor Havertys has announced an increase in its quarterly common stock dividend by 25%, to $0.10 per share from the previous $0.08. This is nothing new. In the press release announcing the new payout, Havertys was quick to point out that it has paid a dividend every year since 1935, and that the new amount represents the highest quarterly rate in its history. 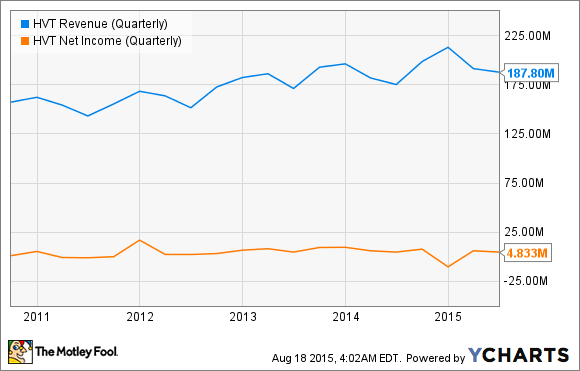 That hike came just after the retailer posted a moderately encouraging second quarter. For the period, net income was $4.8 million ($0.21 per diluted share) -- essentially flat when compared to the same period of 2014. Revenue, on the other hand, saw a rise of 7% across the same stretch of time, to $188 million. Havertys operates a fairly solid, if unspectacular, business. It's managed to grow its revenues over the past few years and stay in the black on the bottom line (although this has been choppy). The firm likes paying a dividend, and since it's got the fundamentals to support it, there's little reason to think that will change anytime soon. Havertys' upcoming payout is to be dispensed on September 11 to shareholders of record as of August 26.